The Leadership Development Series in Hospital Case Management equips supervisors and team leaders with effective strategies for motivating, mentoring and inspiring care management teams within a hospital setting. This interactive and in-depth material – taught in-person by expert case management leaders – can help boost staff satisfaction, decrease turnover, reduce burnout and improve patient outcomes. The Leadership Series curriculum is presented in four day-long courses that combine collaborative learning, robust discussion and hands-on learning activities with practical tools and takeaways care management leaders can quickly incorporate into practice. Get the Leadership Series Brochure. With hospital case management rapidly evolving, leaders are required to be flexible, resilient and supportive as they guide teams through the constant challenges of care coordination and operational changes. Best Practices for Improved Outcomes assists leaders in enhancing key skills like communication, problem solving, critical thinking, collaboration, and brainstorming – processes that ultimately benefit patients and care management teams. Mentorship nurtures staff, strengthens professional relationships, and builds new leaders from within an organization. Participants in the Mentorship course will examine the various styles of mentorship, how to create assurances for success, strategies for raising commitment and competence, and techniques for employee coaching. The course also covers role modeling and activities for mentoring, and why mentorship leads to deeper engagement and job satisfaction, as well as enhanced quality improvement. The Leadership course explores the values and themes that drive individuals who pursue careers in case management, and how they interact with various types of leaders, including charismatic leaders, authentic leaders, and servant leaders. This course also focuses on strategies for effective hiring, and for creating an environment that supports employees, leading to lower turnover and less burnout. Innovation and creativity are considered key to improving organizational effectiveness and fostering a dynamic work environment. The Innovation course teaches case management leaders, supervisors, and mentors how to promote innovation by focusing on quality, education, resource advocacy, and collaboration. Care Excellence training reaches maximum learning potential when completed in work teams in organizations. We offer bundling or customized education programs so you can achieve this goal. 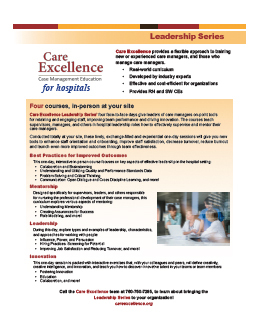 Call us at 760-750-7285 to discuss Care Excellence training for your hospital or health system!